Thanksgiving is coming! You must have planned quite well for the great festival, and so do us in LoA. Be confused about the new events? Don't worry, come with me to find the secret of Thanksgiving! 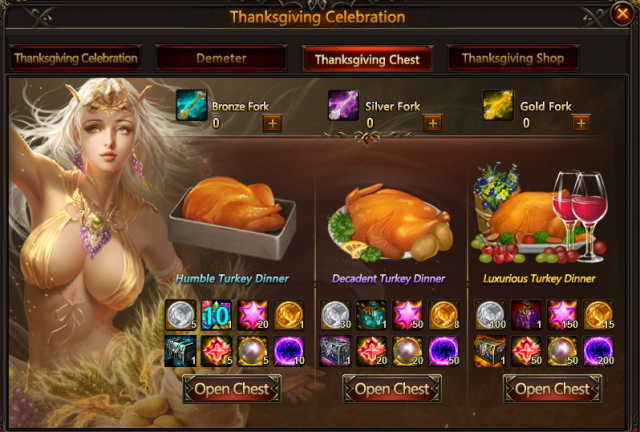 Click the icon of Thanksgiving Celebration, and you will see for parts. 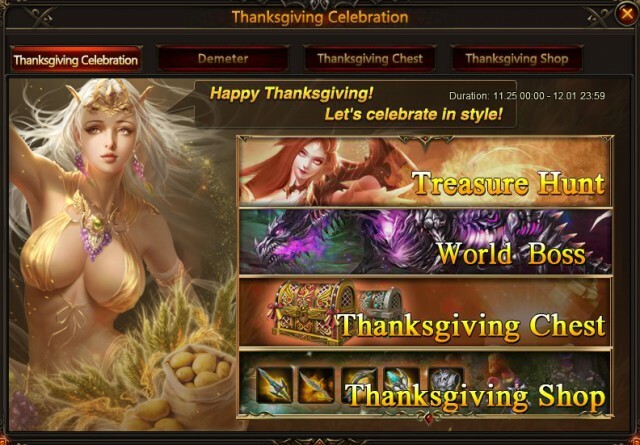 They are Treasure Hunt, World Boss, Thanksgiving Chest and Thanksgiving Shop. This is a brand new seasonal event, where you may find new fun! Click here for more details of Treasure Hunt. 1. Click Demeter and you can see this panel. 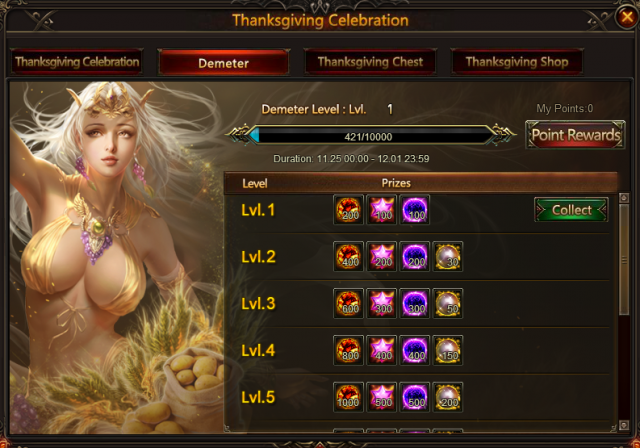 There is point recording on the top of the panel, which records the points all players have got in your server during the duration of Thanksgiving Celebration. 2. Players can get points by collecting angelic coins. 1 angelic gold=2 points, and 1 angelic silver=1 point. 3. If points reach certain level, all players in your server can get corresponding rewards. And we made some improvements this time. If the server points level up more than once during one day, players can get the rewards accordingly. For example, if the server points level up twice, players will get the rewards twice. Can you and partners in your server reach the top level during the 7-day celebration? Come and try! Resources, rare gems and angelic coins are waiting for you in the chests! You may ask, how to deal with the angelic coins I have got? Ok, here comes a chance for you, to exchange items by the angelic coins! Here you can get New mount Celestial King, new angel Demeter, so many rare items! Now you may wonder where you can get the angelic coins and keys. Ok, it's time to go to Hot Events! Description: Reach certain achievement to get items for Thanksgiving events! Description: Complete daily challenges, cheer for Thanksgiving! Description: Reach certain devotion to get items for Thanksgiving! Description: Spend certain Diamonds and collect Treasure Chest! More exciting events are coming up through Nov. 25 to Dec. 1, check them out in the in-game How Events menu now!